For the previous post, click HERE. The Keoladeo Bird sanctuary is something that has always been on my to-do list even before I started to take interest in bird watching and bird photography. I had specifically included a visit to this place on my agenda when I arranged the itinerary with my travel agent M/S Creative India Holidays Pvt. Ltd, and their employee Miss Bhumika. They had included a visit to some other places within Bharatpur, such as the local fort and so on, but I instructed my driver to only take us to the bird sanctuary. We planned to spend a long day here. We hired a guide, one Mr. Amar Chand, who accompanied us on a horse cart as we went in to the main entrance of the sanctuary. At this point, Nishrin decided not to come inside, and found herself a chair and some shade in which to rest, while the rest of us went in. Mr. Amar promised a good time, while the horse cart driver settled for a price of Rs. 150 per hour or part thereof for driving us inside. We complied. The horse cart went in ... they said that the optimum distance would be 7-8 km inside, but we did just 5 km, as time was not sufficient. In the event, we saw over 40 species of birds, including some exclusive ones such as the spotted owlet and some nice hornbills. Here are a few representative pictures from the sights we saw that day. We finished the trip by 11.15 a.m., and began the return then. We finished in three hours! From here, we decided to ask the driver to take us to Agra to visit the Taj Mahal. 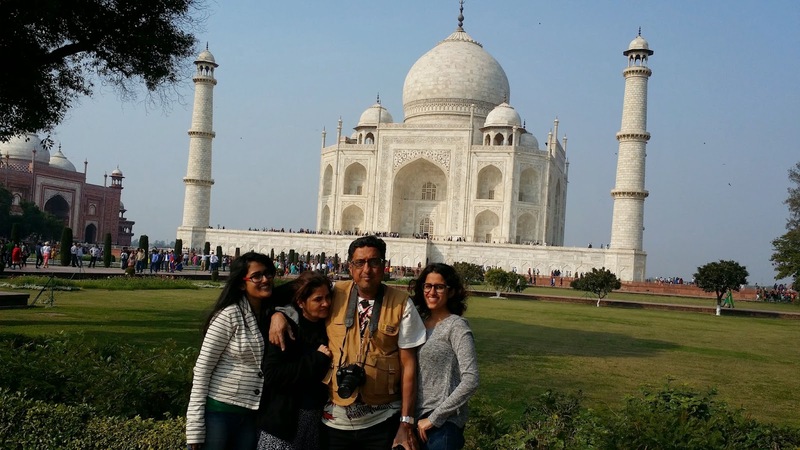 This was an impromptu decision taken by me as my kids and Nishrin have always wanted to go there, and Agra is less than a hundred kilometers from Bharatpur. We paid the driver an extra Rs. 3000/- to take us there, and so, without much ado, we left for Agra, arriving there at a little after half-past one. The driver directly took us to a place called Indian Restaurant. This is an over-hyped place with very high prices. We did not enjoy the food at all, but we had enough to last us through the afternoon and evening, as we took nearly 4-5 hours to complete our Taj visit. What is there to tell about the most famous, most liked monument in all of India? Voted as the best modern wonder of the world in an online poll in 2012, it continues to lure millions of tourists, both from within India and from without, to Agra, and eventually makes the foreigners fall in love all over again, with their own partners, and with India. We took the usual tickets (there is a VIP ticket that allows you to skip the long queues outside the monument). We hired a local guide who stayed with us through the visit. He was a bit peculiar, and I had an argument with him when he showed his unwillingness to repeat a certain bit of information which he had already told two of my family while the remaining two were still out of earshot and viewing a previous attraction. I reminded him of his duty to the profession, and told him not to be rude but humble. After some show of mock anger and chastising, he apologised, and from then on, behaved much better than he had done before the incident occurred. For the next post, click HERE. After this visit, we returned to Jaipur to spend our last night here. Tomorrow, we would depart to go to Jodhpur.